No I am NOT giving away a Go! but if you read the entire post you may find it's worth your time! 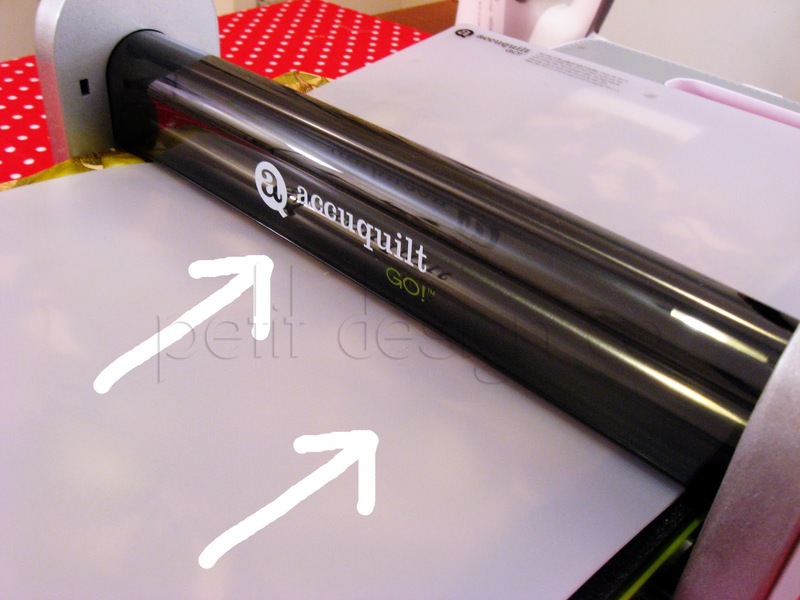 I know there are lots of Accuquilt Go! giveaways going on all over blog land. I know it may seem impossible to win one when each giveaway has hundreds if not thousands of entries. Well I'm here to tell you Don't. Give. Up. You never know whether you will be the lucky duck as I was a few weeks ago. I'm going to share with you my honest opinion on this little gadget. - weighs 15 lbs (my scale actually said 15.4lbs) Am I the only one who thinks 15 lbs is not light weight? Light weight would be something like 10lbs or less in my mind. My heavy Kenmore sewing machine weighs 20 lbs so if I were taking both to a class or retreat I would make sure I'm not carrying these too far. - mats should be stored flat so that they don't warp, making it hard to find a spot for them (the longest one measures 10"x24") and you really don't want to put anything on top because you'll be using it often! - you need a pretty big, clean, stable work surface to use it. I had not seen anywhere the dimensions of the Go! once it is open. Be aware that it's pretty big, not huge but not tiny (about the size of an adult torso when it is closed.) Your space also needs to be flat and clean or the dies might not go through properly. When open the Go! measures 18.5"wide by 30.5"
- if you happen to mess up a cut you'll end up messing up all the layers (but I haven't messed up yet! I'm sure it's bound to happen sooner or later though.) However I've made mistakes with my rotary cutter before too. - Price, the MSRP is $349.00 and includes 1 die and 1 mat. The value die cuts a 4 1/2" (4" finished) square, a 2 1/2" (2" finished) square, and cuts four 2" finished triangles (Half square triangles.) You can find the Go! for around $200-$250 through various retailers. Please note that all of the Go!s include the free value die and mat. Some retailers make it sound like they are throwing in this extra bonus when it comes packaged that way from Accuquilt. - Price of the dies. Actually the smaller dies are pretty affordable ($20-$40) through various retailers. It's the larger and more intricate dies that will cost $50-$80. As a manufacturing minor I understand the cost that goes into making a intricate designs and making larger dies and blades. Keep this in mind as you decide whether this gadget will fit in your budget. I have no idea how long the dies will last as I've only had mine for 2 weeks. With proper care I would hoe to get several years of use out of a single die. The trick is to purchase dies that can be used for several other cuts. For example, a strip die can be used to cut strips, squares, and diamonds! 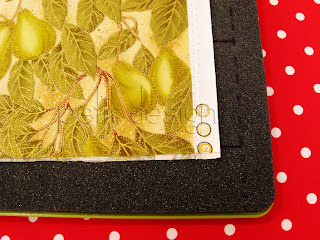 There are lots of tutorials popping up showing how to use the dies creatively! 1) The first thing you need to do, if you haven't already, is to mark your die. 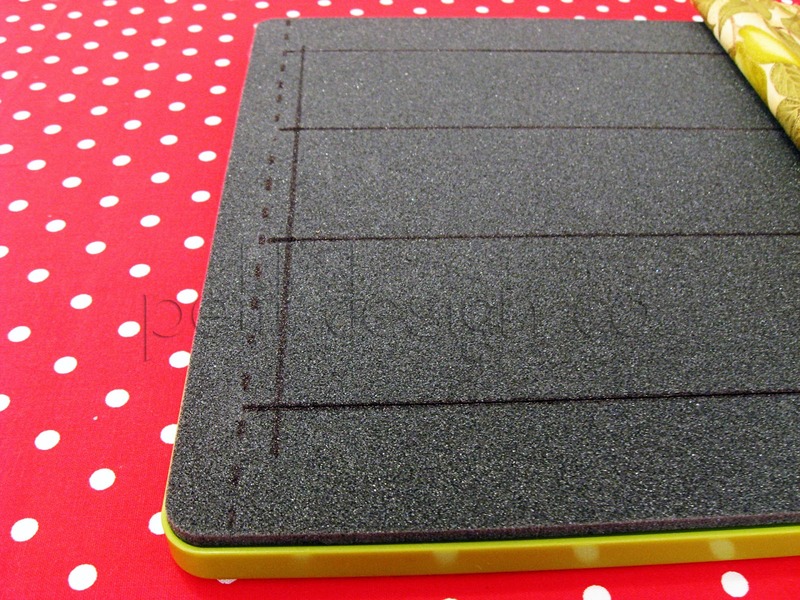 You take that sharpie and stick it down into the foam and run it along the blade. 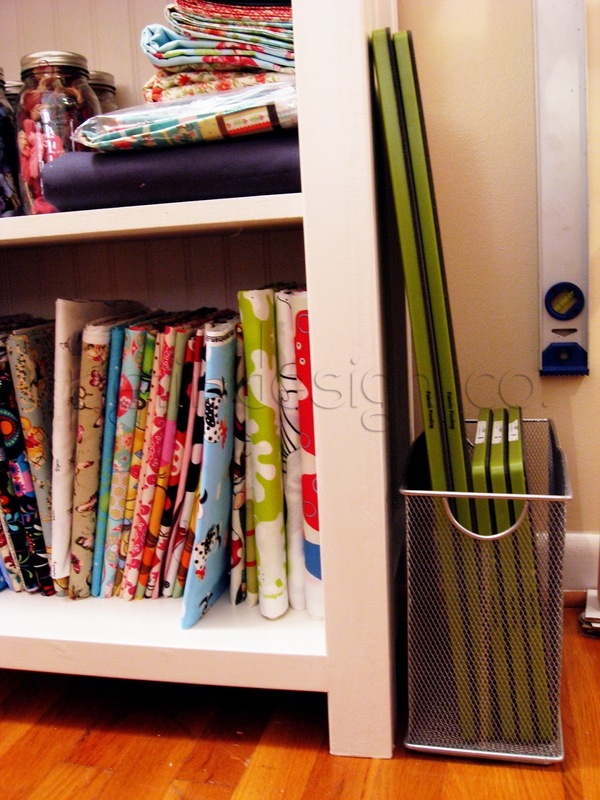 This is so you can see where you have to place your fabric. The next mark you want to make is a perpendicular line (the dotted line) at the end of the cutting blades. Do this on both ends of the die. Then make a solid perpendicular line a 1/2" in from the dotted line. Mark this on both ends of the die. This solid line is where you will line up your fabric so that your strips will be cut all the way through the width of the fabric. 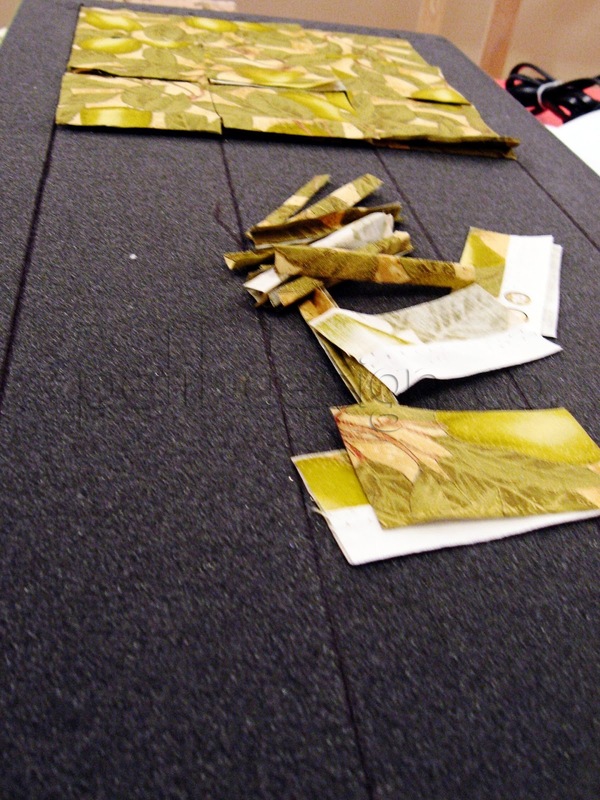 3) Make sure that all layers of the cut edge of the fabric cover the first blade. This step is like squaring up your fabric using a rotary cutter. If there is one layer that does not cover the entire length of the blade then that strip will not be perfectly straight. 4) Now place the die on the Go! 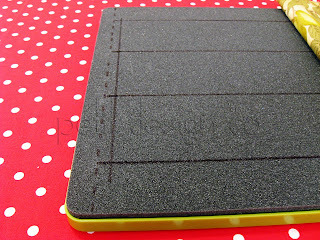 Place your cutting mat on top of the fabric being careful not to shift your fabric and run it through your Go! 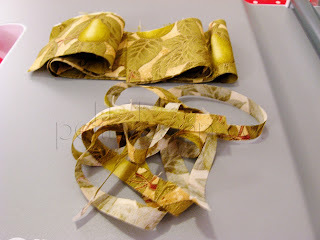 3 strips of fabric 2.5" wide, a slightly narrower strip that can go in your scrap pile, and the only waste are those little strips that you would have wasted with a rotary cutter as well. 5) Now take your first strip (still folded in half and keeping the cut edges lined up) and lay it back on your die with the cut edges lined up against the solid line that is perpendicular to the blades. Make sure that the folded edge of of the strip sits just below the first blade other wise you'll end up with 1 rectangle amongst your squares. Now accordion fold the strip until the entire length fits on the die. As you accordion fold, make sure that the folds of the fabric are either just below the bottom blade and just above the top blade. Repeat with the other 2 strips making sure that you line up the cut edges with the cut edges of the previous strip. Carefully place the cutting mat on top of the die and run it back through your Go! Guess what? You can leave the die on the Go! as you are rearranging fabric and then crank it through the other way. It works both ways so you can be even more productive! It's a metal hanging folder organizer and I know I've seen them at office supply stores. I like that I can tuck it in an out of the way corner of the floor. I just make sure that the die stickers are facing out for easy choosing. I'm sorry I'm not giving away a Go! ...but my friend Gene is! Head on over to his blog and leave a comment for a chance to win a Go! d) the fact that it's starting to cool down in the south! lots of things to celebrate! So leave me a comment telling me something other than "pick me." What will you celebrate this month? what do you like about Autumn? What are you working on? Something interesting about where you live. You can have 1 additional entry if you do one of the following: follow my blog (I don't' care if it's in a reader), follow on twitter, or hit "like" on my FB page. Leave a comment for each entry (maximum 2 per person) and make sure you leave an email if you don't have your blogger profile set to receive emails. If I can't contact you then I will pick someone else. Comments will remain open until October 15th at midnight. I will pick a winner via RNG on Saturday morning. International entries are welcome! Oh yeah, what am I giving away? How about 2 highly sought after Out Of Print Heather Ross Lightning Bugs fish FQ's! One lucky winner will get these 2 fun FQ's. And please remember to come back tomorrow for a fun tutorial on what to do with all those 2.5" squares! PS this post was written before the announcement of the new Go! Baby. Now that I would consider lightweight! You really made it look easy! That fabric is adorable. I would love to have it for MY celebration...in the middle of the month...I'll be ** years old! Thank you for that really indept insight into using the GO cutter! That is really helpful and great tutorial too! Congratulations on your milestones and on winning a GO! The gold fish are totally cute.. I am definitely signing up for that Go! giveaway! Looks awesome! Ps. I'm totally a follower! In October I will be celebrating several family birthdays. I will also celebrate the cooler weather. I will celebrate that giveaway I am doing also. Oh yes, and tonight I will celebrate my cumpleaños (birthday) one more time with a nice dinner at Mexico Lindo. ahhhh. My wife and I will be celebrating our 14 year wedding anniversary this month. Thanks for the chance! An extra bonus from one GO! owner to another.. When you outline your die blades, try a silver Sharpie, you can see it much better than black! I am a follower. September 30th is my B-day, that is always a good start to the fall season. Congrats on winning the GO! and for the nice review. Thanks for the giveaway. I already follow you .. I love autumn for the crisp days and nice breezes. My husband and I are almost finished semi-finishing our previously unfinished basement area for my new Innova quilting machine! its awesome. i love finding new blogs! i have been working on lots of small projects for swap groups! i love apple picking and fall camping! it's refreshing to find an honest opinion about the go cutter. Love this fabric! Thanks so much for sharing! I'm working on way too many projects, as usual, but am most excited about the new bag I'm making for my little sister. Planning to decorate for Fall this afternoon and drink lots of apple cider. Have a great weekend! WOW you made that look easy. Can't wait to get a GO of my own. Maybe for Christmas. This month I will be celebrating several birthdays and 2 new additions to our family. I will also be doing the happy dance over the fact that we can now open the windows and enjoy the weather. I follow your blog, like every day, does that count as stalking?!!! thank you for the in depth details on the go, and the pics! I will be celebrating my 6 year wedding anniversary this month, on October 31st....Halloween! i am leaving a comment that i am a follower! I can't decide if I want one of these Go! gadgets. They look nice and fun, but I sort of enjoy cutting out the pieces for my quilts. I can see where they would be an EXCELLENT money-maker, though. Thanks for the opportunity to win the FQs. I also follow your blog in Google Reader. Wow! What a generous give-away. Thanks so much for your detailed post about the cutter...I think it is still out of my price range, but maybe I'll try to win one around blog land. As for me, I'm working away on bee commitments and trying to quilt a quilt I've had in the works for almost 5 years. I have already asked Santa for a GO for Christmas... :-P I am excited about October and fall because my first baby will be born this month (or early next month. I also love all the fall stuff - colorful trees, pumpkin pie, sweaters and jeans, etc. well it's Spring here in Aus and I look forward to not turning the heating on every morning, smelling the fresh warm air and watching the bees buzzing around the gorgeous bulbs popping their heads up everywhere. I'm celebrating this month the birth of my siser's baby!! It is due to be born any day and I am very excited for her. Thanks for the opportunity. I'm currently working on some quilts for xmas gifts. The HR prints are great. I'm a follower too! 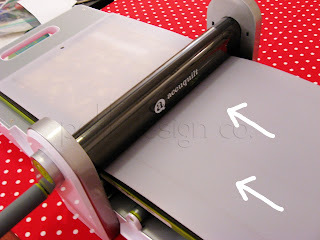 love the blog and how you explained the GO cutter. I must admit I'm celebrating this cooler weather in Georgia - and praying it stays around!! My sister's 30th birthday is this month as well, and I'm sure we'll do something to celebrate!! Hey! How cool is it that you won a GO! That would be really neat. I am with you about it finally cooling down here in the south! I love being able to have my windows open all day and not be too cold or hot. It has been so enjoyable! I am celebrating my 30th birthday on Halloween, so that is the excitement of the month in our home. What a great post - I've always wondered how useful the Go! was, and if many people were using it. I love that you can whip out so many squares so quickly! And what a great giveaway - I love those prints! that might have been the best review ive seen on the Go! and you are not even giving it away! seeing those 2.5 squares cut so quickly makes it a very tempting purchase...but ill have to try my luck at winning one! im trying to finish 2 quilt as you go quilts for my nephews...totally have lost steam...next project is a table runner for my sister...no steam at all for that, and no way ill make the deadline of one week! thanks for a chance at your great fabrics...id likely use them in a quilt, after enjoying them sitting in my stash for a while! Congratulations on everything! I love your candid take on the GO! Honestly, most of the blog reviews of the machine just rave and rave, but really, the thing is hundreds of dollars. I wouldn't be opposed to winning one (although the chances are ridiculously slim), but I would rather spend that money on more pretty fabric. I am a follower too, btw. 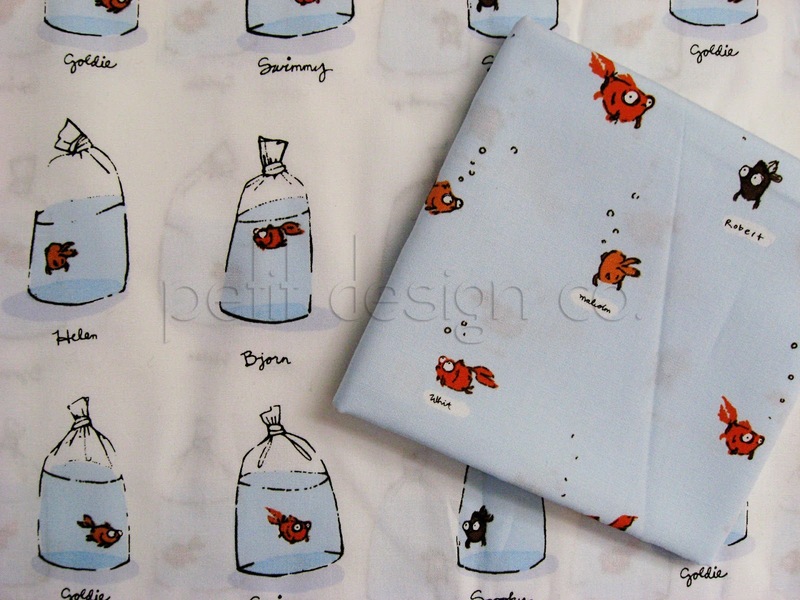 I would love the fish fabric with the blue background. It was interesting to read about how the acquitter worked. Thanks for sharing. Thanks for the giveaway. Yes, I love autumn! I just finished making fall fabrics into bunting for decorating. Very cute :). Thanks for the straightforward review; it's refreshing, especially since the price is a real investment for some folks. I do love the cooler weather - it's finally autumn here in New England - and October holds my birthday so I'll be celebrating that later this month! I'm excited to celebrate my birthday one week for today! I love the fish in bags too! My email is jhochsztein@gmail.com. Right now I am loving the cooler weather and trying to finish up a quilt that I started months ago. I'm also trying to pare down my list of projects I want to do and figure out what to do next! And I am a follower through my google reader! Thank-you for your very honest post...I just purchased a GO! yesterday and my friend is picking it up for me in the city!!! I am suppossed tp wait for Christmas but it will be so hard. This month is the anniversary of the death of my FIL last year...it is hard on my husband and 4 kids and my MIL. I would like to make her a quilt to keep her warm as she learns to live alone after 52 years of marriage. my favorite part of fall is that it's finally cool enough that I can walk my dog again -- she's a pug mix, so the 90-degree summer days are not her friend. Now that things are a little cooler, we can BOTH get some evening exercise. win-win! omg, I would just die for these little goldfish! I've long admired those little fish, but, alas, they are out of my budget. Now that October is here my daughter & I will enjoy getting out the Halloween decorations. I think a little spooky house quilt is in order. The goldfish are adorable and would LOVE to get them...I'm slowly but surely starting my own little heather ross collection. Thanks for the chance to win this fab fabric! I have to say that autumn is my favorite time of the year, what a gift to our senses! The leaves changing, pumpkin patches and apple squeezes, cool breeze mixed with warm sun, I LOVE it all! I loved your honest review of the GO! cutter. I had no idea of the "real" size. I'm working on a Nicey Jane quilt for my little girl. A little more quilting to go... then binding... then a spin through the washer. Just found your blog. It's really cool and your Etsy shop wonderful. Well, this month I think I'm going to set up a Flickr account. I've been thinking about it for awhile and I think I'll give it a go. I'm also a follower! Thanks for the chance at such cute fabric. Great post! I was wondering how easy it was to line up the strips so the squares would be square. Thanks for the tips. My exciting news for this month is that our daughter is graduating from Army basic training at the end of the month. We are flying from Florida to Oklahoma to see her. It's the first time I have ever flown too. This Go review is awesome. I think I "need" one. This month (october 5th)I will celebrate my 34th birthday so is the perfect ocasion to ask for a Go to my hubby :). And wishing you all the best and succes with your business start, yeah!!! Very Informative post. Thanks for that...if I ever get a go, your tips will come in handy. Now as for my favorite part of fall...I'm guilty to say caramel covered apples with peanuts! YUM!! I keep trying to win one...thanks for the review. I am working on a doll for my little girl's 2nd birthday. October is my favorite month of the year! I love fall .... the nights getting longer leaves me so much more time for the homey activities I love. The cooler weather makes me more active and enjoy outside activities much more. I love the new tv shows starting to I can have some couch time at night and embroider. Do I even have to mention pumpkins, gourds, apples, round hay bales, etc etc. I'm adding you to my google reader! I love autumn because that when temperatures actually start to drop around her. I love the ffotball weather feeling. I love fall because it is still warm enough to enjoy with the humidity of summer here in the south! I also think the fall colors are amazing. Can't wait to see what you do with the 2.5 " squares. wow, that's a lot of milestones to celebrate! i love autumn, mostly for the beautiful colours the season brings. my friend and i just drove out into the country side last week and see the leaves. thanks for the giveaway! i added your blog to my google reader! Thank you for that review, I appreciate the objective viewpoint on cost, weight and space, things I hadn't read before. Very helpful in my decision making process! In October I will be celebrating my 29th Wedding Anniversary! Great fabric and your post about the GO! was very informative! And "I Like" on FB! We are celebrating Spring in Australia so the blossom is out! Thanks for your view on the "GO". I am a studio person myself. I am glad the weather is changing so I don't have to feel guilty for staying in and quilting. Love your blog and I am definitely going to follow! Thanks for the great review, tutorial and (best of all) giveaway! I'm celebrating two things this month: my 10th wedding anniversary, and my birthday. I love October!! I appreciate the review of this piece of equipment, and especially the chance to win some fishies! Happy blogiversary! And Congrats on the new shop AND winning a Go! I found your blog because I also won a Go! I was SO surprised! I never thought about getting one so I wanted to learn more about what real people thought about them since I've got one coming to me. I googled for reviews and yours was one of the links to pop up. So in answer to one of your questions I guess I'm celebrating my win! Just stumbled on your blog... I'm currently completing one of my first quilts... hope to finish it up early this month! Great review. I'd love those goldfish! I was in Austin, TX for a conference this week -- what a wonderful city. But I'm happy to head home and be there for the whole month with no travel. Thanks for the chance to win. That is a great review! I eye the go! cutter every time I go to the fabric store and really wonder if it is *that* useful! And thanks for sharing thos fabrics! They are my FAVORITE! Hey! I'm in Alabama too. My son and I went to an outside birthday party this afternoon, and it was actually a little chilly! Thanks for the review of the Go and for the sweet giveaway! I'm looking forward to Halloween, to the point where I've been reading Halloween books to my 2.5 year old to try and get her ready for the idea. Last year she burst into tears when we tried to take her out trick or treating. I think it's going to happen again, because she's decided to be really scared of ghosts, to the point where she can't watch one episode of her favorite show because the little brother dresses up as a ghost. I am fresh (4 hours) back from a quilt retreat where I worked on placemats for Meals on Wheels, the back for a stacked coins wall hanging and the applique on a block of the month quilt. It was a busy weekend. What cute fabric you are offering...wonder what I will make with it when I WIN it??? Thanks for the honest feedback on the Go! cutter. I've been wondering about the pros and cons... And congratulations on your blog-iversary. I am celebrating a 6-month blog-iversary myself. Meanwhile, in Real Life, Wonderful Husband and I are celebrating 34 years of marriage this month. (Am I really THAT old?) I'm turning into my parents!! I love fall first of all because it starts to cool off. I'm originally from the Northwest, and now live in Florida, and I love it when the HOT is over. I love fall colors and fall smells and fall FABRIC. 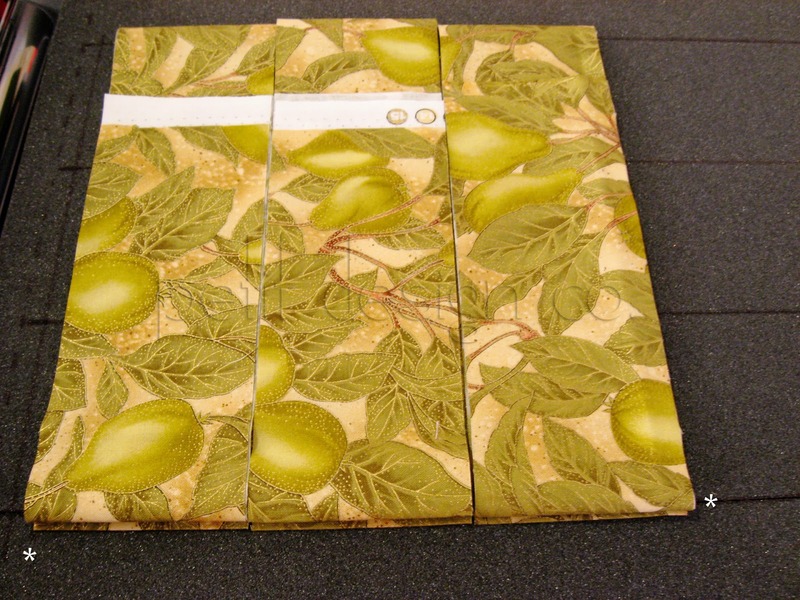 I've been working on quilted fall table runners. So pretty. Anyway, Happy blog-iversary and thanks for the chance to win! I LOVE Heather Ross! And I'm now a follower... My daughter, Mrs. Darling introduced me to your blog. Thanks! those fishy are stinkin' cute! I'm so looking forward to october..even though it doesn't get that cold here in the bay area in CA, the leaves sure turn awesome shades of orange/ brown...looking forward to that! I've wanted fishies for a while. This month is kind of crazy because I'm getting married on the 16th! I'm really excited about it and it should be a wonderful day! Thanks for stopping by my blog! I am now following your new blog! LOVE that fabric! Tomorrow we'll be celebrating fall by taking a walk on the beach. It's so much fun to bundle up and walk along the water when it's crispy out! Just celebrated my 40th and despite feeling a bit mixed about it I have had a great time! Wow winning an accuquilt, fantastic! thanks for such an accurate review of the Go! I entered a giveaway for one, I hope I'm as lucky as you! Here's something about the place I live: a small island, attached to mainland by a causeway, with the sea on either side and the tide going in an out. All kinds of birds come to find their snacks at the shores... it's a beautiful, peaceful and magic place. I love fall - it's starting to really feel like it here in richmond va... and I just finished decorating my fall mantle! I love fall, the crisp air, the color of the leaves, apples(they're my favorite). I always start making Holiday crafts. I love everything about this time of year. Hooray! Thanks for the fabulous tutorial. I didn't know such a thing existed. This fall I am sewing softies galore! I love your tutorial, now I want an Accuquilt more than ever. I have entered Gene's giveaway. It is Spring here in Australia, and we live in the middle of Victoria, a southern state. Behind us we have a feild of Canola, in full bloom. Lambs are being born across the road and the sun is finally shining. We had a flood last month but really needed the water! I have the same name as you! Trying again, too many at the same time gave me a "service unavailable" message. Just want to get in on this adorable fabric giveaway! Thanks! Love this fabric! I'd love a Go machine too but I'll have to keep hoping!! I am working on a wedding quilt for one of my employees. Most challenging thing I have ever done and the most beautiful. Very exciting! Thank you for the giveaway! congratulations :D i'm knitting some hats for friends' and family's birthdays and christmas, can't believe christmas is coming in 2 months. I love fall! It's one of my favorite seasons. I love the feeling in the air, the leaves changing colors, seeing farmers out in the fields harvesting, eating pumpkin pie and apple cider, going to the pumpkin patch, going to the apple orchard, cuddling under flannel sheets when its chilly outside...I could go on forever! Thanks for doing such a great giveaway!! I'm working on my first string quilt at the moment, and man is it ever taking a long time!! But it is already looking really great, too, so I'm not complaining too much. And now I'm officially following you! Thank you so much for the clear illustrations! What I love about fall is the pumpkins. The not everyday variety kinds. I love seeing them all over people porches. I am celerbrating my daughter this month. She makes me so proud to be her momma. I'm working on making christmas gifts and finishing a few quilts that I have been working on FOREVER! Just started following you!!!! YAY! 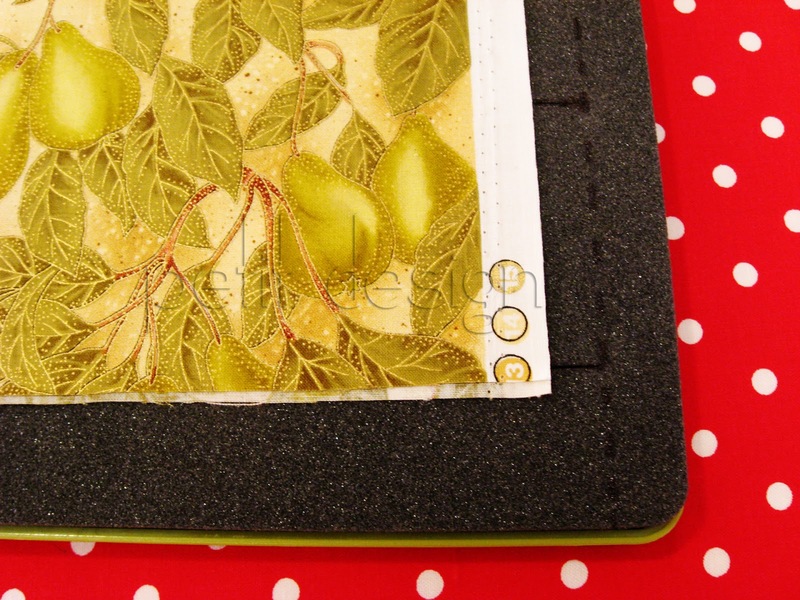 Thank you for the indepth tutorial and straightforward review about using the GO!cutter. Congratulations on meeting so many big milestones and on winning a GO! I do not own any HR and these gold fish are awesome. Thanks for the celebratory giveaway. Love those goldfish! I read that HR will have a new line through Kokka at Quilt Market next spring. I'm a new follower - thanks for the Go review. I'm on the fence about it, but started saving. Where I live it's not Autumn, it's Spring, and the weather has been overcast, windy and drizzling with rain. Congrats on all the milestones mentioned, Norma. I love your tutorial about the GO!. It has different angles than other tutes I've seen, so Kudos to you. Thank you for your generous giveaway. My 3 yr old is looking over my shoulder as I write this and went banshee-loco over the robot in the previous post! It's wonderful! WE are now followers. me for your insight, humor and tutorials, and my son, Davis, for your robot making skills. Thanks for all the useful information about the Go! Cutter. I actually am not a quilter myself, but my mom is. She turns 50 this October, so I have been scouring the web looking for opportunities to win a Go!. When I stumbled across your blog I was very impressed. Thanks. Drat! I had convinced myself I didn't want or need a Go, now you went and reversed that! Interesting about where I live: I live in Scappoose, OR the town with the world's largest peace candle. It's huge and bright red (used to be yellow) and everyone jokes about it looking like a stick of dynamite! Thanks for the fabric giveaway! In September we celebrated our son's first birthday, on October fifth we celebrated finding out we're going to have another baby in June, and two days later, we celebrated my husband's birthday. I already loved Autumn, but now it's especially special to me. I'm also celebrating a birthday of a former preemie baby! My girl was born at 33 weeks and 4 days at 4 lbs 8 oz. She'll be 2 this month and to celebrate I'll be taking over 25 quilts to the NICU where she stayed after she was born to give to the babies and families.... my quilt guild has been wonderful to take on this project over the last few months! and I'm subscribed to you in my reader now, too! The nut club festival is going on here in Indiana and has many interesting things to eat. Brain sandwiches, deep fried butter, and scorpion lollipops to name a few. Thanks for the great giveaway! I'm hoping that I'll be able to celebrate buying our first house. What a rollercoaster it has been so far! I'm working on finishing one of my mother's UFO's from the 1970's! I sew quilts and pillows and all kinds of non-wearables, but I don't sew clothes. (A few disastrous pairs of PJ pants have discouraged me from this!!!) However, today I tackled a halloween costume... and it worked out great! Yay! So, there is much celebration here. Tried out the AccuQuilt - the Fall Medley and cut out wool shapes. Stitched up a really cute runner. A piece of cake to cut it all out! I don't like autumn - at all. But today is very special day and I'm celebrating that I won in giveaway:) for the first time:) and all month I'm celebrating becoming a bee - quite new too me and so exciting!!! I'm following you in Facebook now! Oh, what WILL I do this month? I'll be praying daily for the weather to finally cool off! :-) I'm a northern girl stuck in OK! Ugh. Ooh! Just love those prints :). I am currently in several swaps, one of which is the 3x6 Bee, so I am excited about starting on those blocks soon! That's one thing I'm up to :). I also signed up to receive RSS feeds of your blog, so here is my second comment :). I am also refinishing a dresser (changing it from an outdated wood look and painting it a sleek modern white. Still undecided about knobs - eventually Anthropologie I think!). Thanks! My favorite thing about fall is the leaves. Having grown up in the Seattle area, I'd never experience the color change before moving to the northeast. Now I anxiously wait for the leaves to turn as soon as it cools down. Thanks for the chance to win some great fabric! Wow! I really want a go! after watching how quickly you cranked out so many squares! But I guess a chance at some fishy fabric will have to do for now! ;o) I'm working on a wallhanging, and hope to start a quilt for my daughter soon. I'm a follower of your blog now too! Thanks. found you looking for gocutter info - you've done an excellent honest review - MUCH appreciated..
oh yeah! my birthday !! party celebration at FHC blog if you care for tea & cake ? thx for celebrating your successes with us :) CONGRATS!! that 's Great accomplishment! and fall is always good to celebrate change it seems! i LoVe it :) pumpkin pie and thanksgiving for us Cdns !! Oh I love this tutorial! I have been enjoying using my GO! Cutter too! I just got the Dresden die and can't wait to use it. Thanks for the wonderful giveaway! Thanks for the detailed review! I'm still on the fence about the Go! cutter--though I'm not adverse to winning one! This Fall is full of celebrations for our family. Both my kids celebrate a birthday and my hubby is coming home from Iraq! Hooray for Fall! What great fabric. Working on lots of projects! Never seem to have enough time. Need to finish my candle mat for the swap and a challenge for my quilt guild. Love fall-my favorite season--except today because it's raining!